Patrick's passion for cooking was inspired by his Greek Mother who would always cook a diverse range of traditional and innovative southern European & Middle-Eastern Foods. His passion and curiosity sent him on numerous culinary journeys across Europe and Asia further fueling his passion and understanding for cooking. 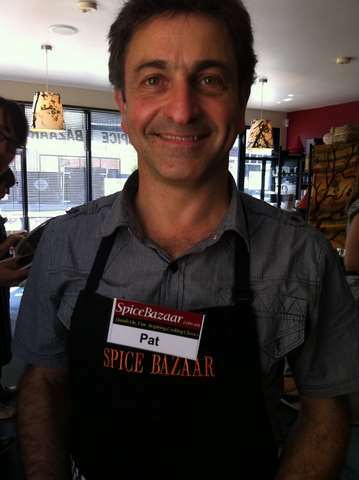 Patrick Aldred is co-owner with Jill Rowe of the Spice Bazaar Cooking School. Patrick’s inspiration was sparked from a very young age by his mother who was born on the Greek Island of Kos within sight of the Turkish Coast. Her passion and creative flare for cooking saw her preparing fabulous Greek and Mediterranean fare as well as Middle Eastern and other diverse cuisines and she was the greatest influence on Patrick’s early cooking development. With a love of being in the kitchen and learning new cuisines, Patrick has traveled around the world with partner Jill Rowe extensively and continues to travel every year – across Europe, Asia, India meeting chefs, frequenting mainstream, out of the way and street food restaurants in search of interesting and traditional food and techniques. With an effervescent character, and with an enthusiasm that is infectious, he regularly presents at public Food and Wine Shows and Industry Events. Patrick enjoys showcasing innovative and traditional combinations of cuisines, flavours and spice blends. Patrick also researches widely, using a range of media investigating food trends and traditions. He brings all this together, along with his unique touch, to present exciting menus at the Cooking School. Patrick’s enthusiastic style, engaging, fun, patient and approachable manner ensures that every class is a success. On the menu at some of the events he presents exotic dishes such as Chilled Sweet Pea & Watercress Soup with Rose Petal Cream, Moroccan Tagine of Chicken with Ras el Hanout, Honey, Pomegranate Molasses and Piquillo Salad (roasted sweet pepper salad). In his spare time, Patrick loves to cook, particularly at wineries across Australia and in Europe, working on wine matching. He enjoys time camping in the bush with his RV and camp kitchen working on new menu ideas. His strong interest in wine sees him visiting wineries wherever he travels, and wine seminars regularly to further his knowledge and understanding of how wine and food work together. He loves to go bush walking, climb mountains, swim, snorkel and scuba dive seeking our corals and fish both in Australia and overseas. Patrick is also an avid guitarist and loves his music.